A few hand-held volley guns were also developed during the 18th and 19th centuries. One of the most distinctive was the “duck’s-foot” volley gun, a pistol with four .45 calibre barrels arranged in a splayed pattern, so that the firer could spray a sizable area with a single shot. The principle behind this type of pistol is one of confrontation by one person against a group; hence, it was popular among bank guards, prison warders and sea captains in the 1800s and early 1900s. 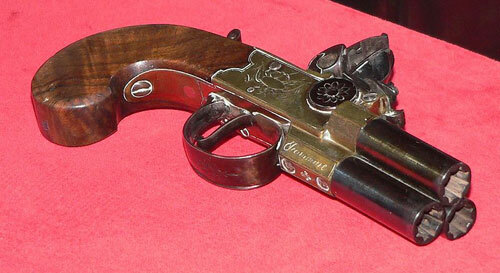 The British Royal Navy used gunsmith Henry Nock of London’s volley gun around the time of the Napoleonic Wars. Henry Nock made a seven-barreled gun capable of firing seven .50 calibre pistol balls at the same time, intended for use in repelling boarders or to clear an enemy deck in advance of friendly boarding parties. However, its immense recoil made it an extremely physically demanding weapon to use. The Nock gun was recently brought to public attention by its inclusion in Bernard Cornwell’s Sharpe novels where it was wielded by Sharpe’s friend and colleague Sergeant Patrick Harper. It is worth noting that in addition to the recoil problems, this weapon would have required almost two minutes to reload, even in the hands of an experienced soldier. 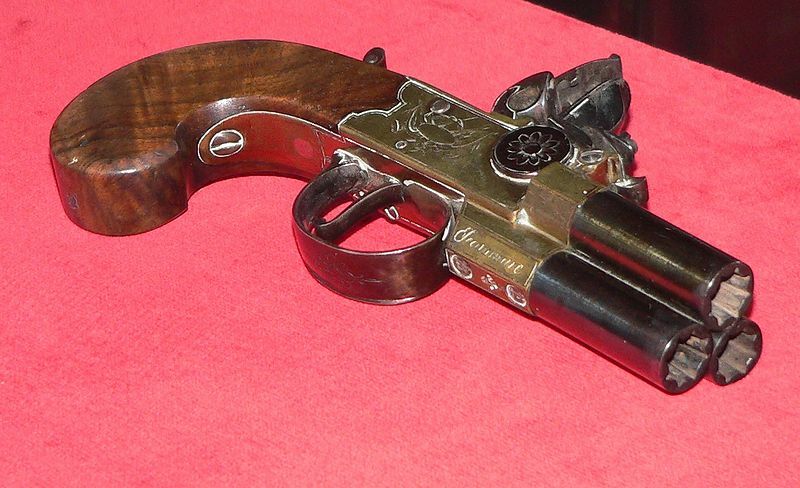 The Duckfoot Percussion Pistol was a truly strange Naval pistol. It was also called the “Early Mutiny and Riot Pistol”. 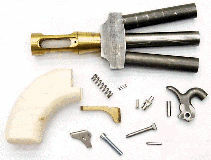 The Duckfoot was a 3-5 barreled weapon, with the barrels pointed in a “splayed” configuration (like a duck’s foot). All barrels would fire at the same time, hoping for hits on multiple individuals in a crowd. A few were still in service at the beginning of the Civil War although they were not favorites because of their severe inaccuracy. It was originally a British Naval flintlock pistol from 1790 to 1840, and was copied by the American Navy as a percussion in 1840. The final year of production was 1860. This three barreled percussion version has the central barrel tilted downward so that there is a vertical spread as well, this very rare English example is signed by ‘Lord’ of London.